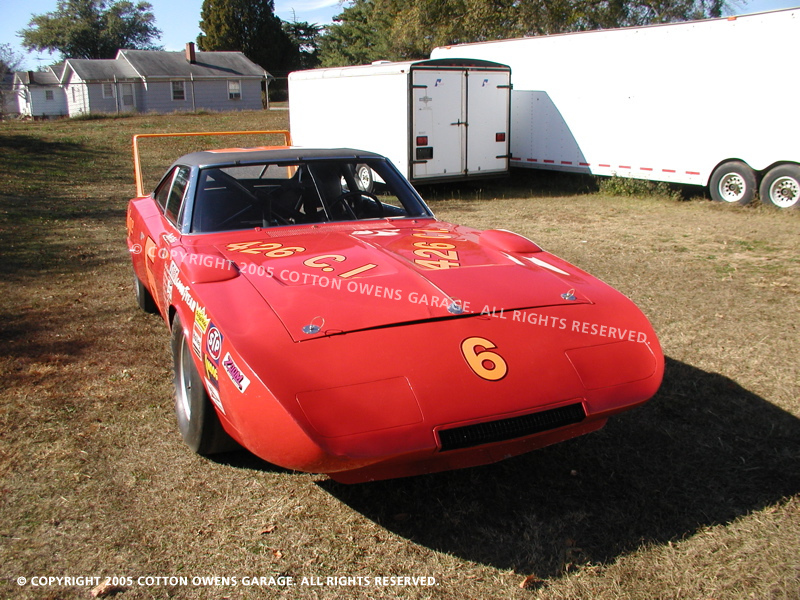 In 1970, Buddy Baker drove this Cotton Owens #6 Charger Daytona to a second place finish in the Firecracker 400 at Daytona in July, to fourth at Atlanta in August, sixth at Michigan on August 16, and fifth at the Talladega 500 on August 23. 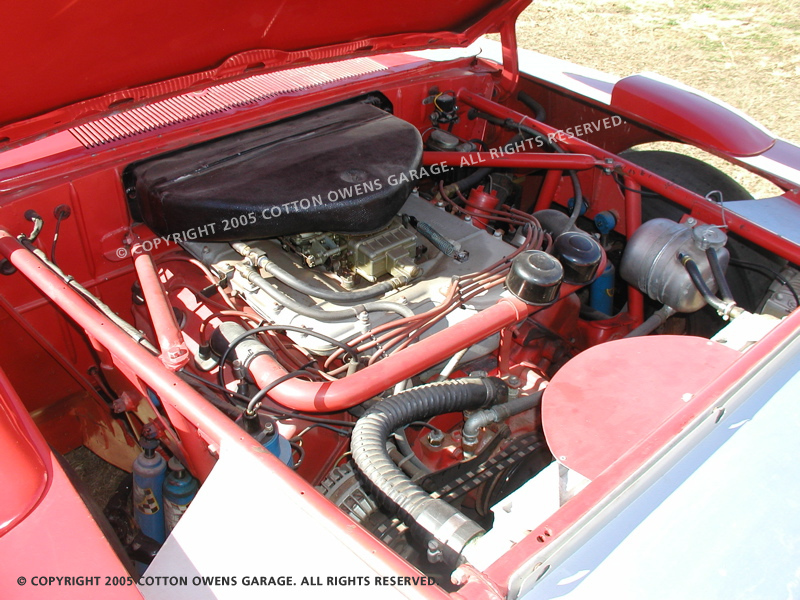 This car, powered by Owens' legendary talents with the 426 Hemi, would help push Baker to to speeds exceeding 200mph on the superspeedways of Talladega and Daytona. 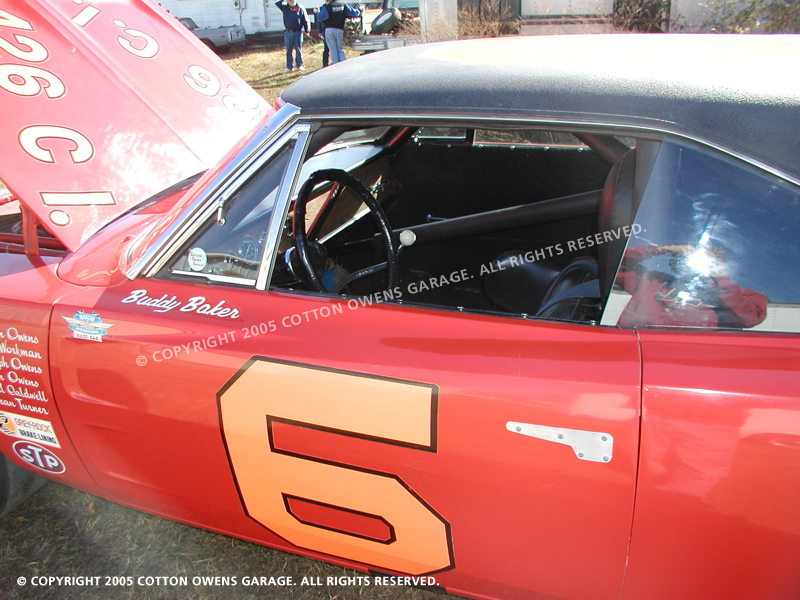 In September, 1970, Buddy Baker would give Cotton Owens perhaps his most prestigious and sought-after race victory behind the wheel of this famous #6, when he won the Southern 500 by a lap over second place Bobby Isaac at Darlington, SC, a race Cotton had entered for 20 years and never won. On the Saturday night before the annual Labor Day classic, Owens was inducted into the National Motorsports Press Association Hall of Fame. By now NASCAR had announced the rules for 1971. 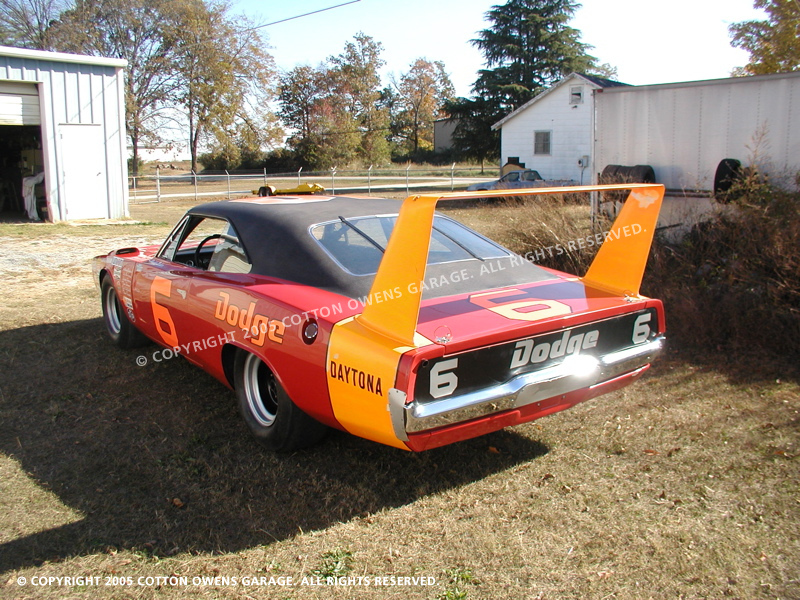 They limited the aerodynamically bodied cars to just 305 cubic inches displacement, spelling the end of the brief, brilliant career of the Dodge Charger Daytona and its counterparts from Plymouth, Ford and Mercury. 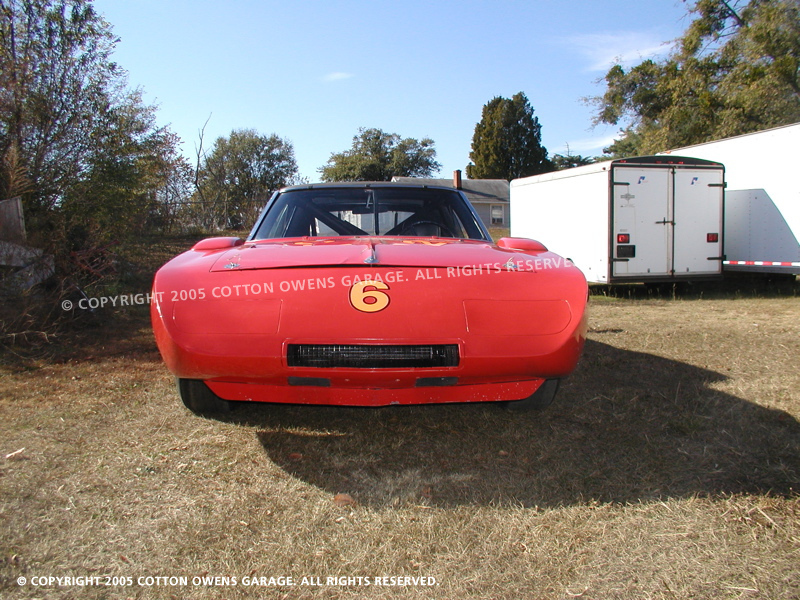 When this car was in an accident at Charlotte on October 11 (after qualifying third and leading twenty laps) Owens rebuilt it as a display car to participate in Dodge's national promotion of the 200mph lap. 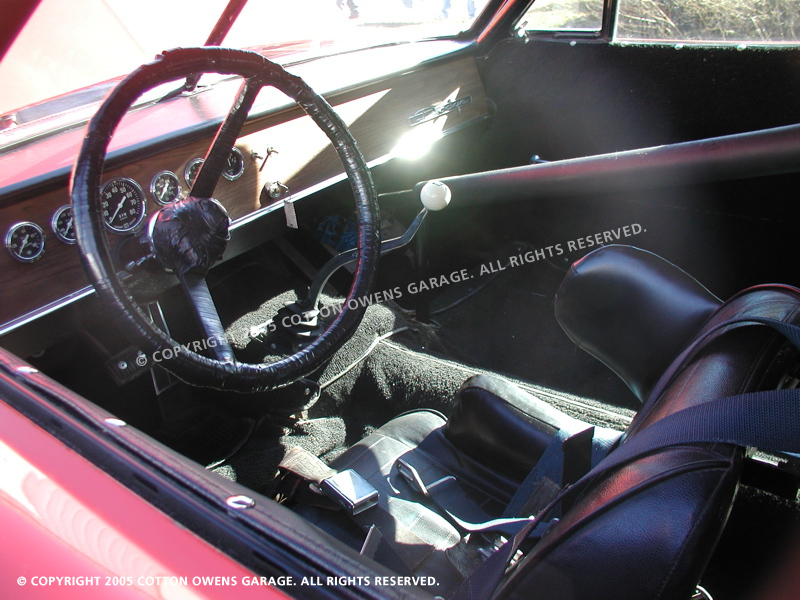 In rebuilding it, he made the changes to the interior, doors and windows that are visible today. 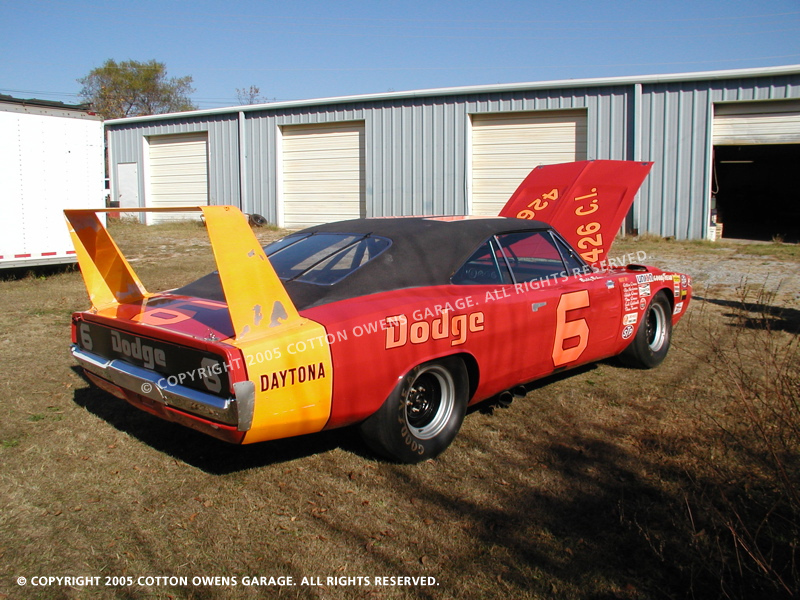 It was displayed by Dodge at Cobo Hall in Detroit in January, 1971 then was brought back home to Spartanburg before being taken to the Joe Weatherly Stock Car Museum at Darlington – NASCAR's first superspeedway – where it remained on display for almost 25 years, serving as a superlative example of a famed, golden era in American racing. 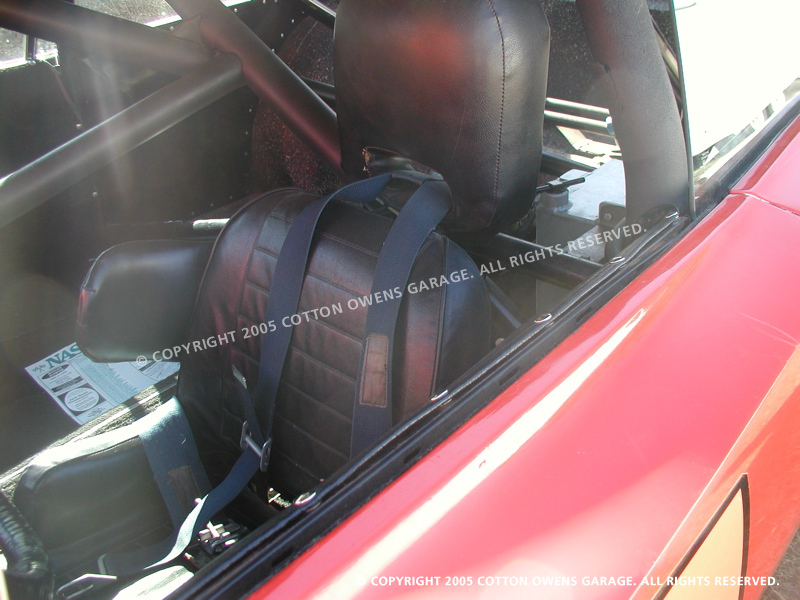 These photos were taken in 2005, soon after Cotton retrieved this car from the Darlington museum. The subject of much folklore, myth and rumor that is still hotly debated even to this day: Was this very car the one to set the official 200mph record in NASCAR? The answer to this question has been somewhat complicated over time by the fact that "official" records were muddied by the PR blitz that Chrysler Corporation put out during that era. The truth is that many winged Daytonas were running over 200mph at various superspeedways, during practices, test sessions, and race events. Some quotes and anecdotes from actual Chrysler team members who lived this part of history are included below. One should first understand that if a car records a lap at or near 200mph, then that car is going well over 200mph on the straights, around 210-215mph depending on the track and conditions, etc. A qualifying lap time of even 199.38mph means that the car's speed averaged 199.38mph around the entire track, which includes several left turns that slow the car down. So the top speed achieved on that lap is much higher. However, these laps were not "official" because to be official it had to be done in two directions, with no other cars on the track, under certain conditions, with calibrated, precision timing and all the things that go into setting an "official" record. So, Chrysler recognized that indeed the magic 200 mph barrier was being broken by their winged cars, but they needed to set an "official" record in order to claim it in the record books for good. 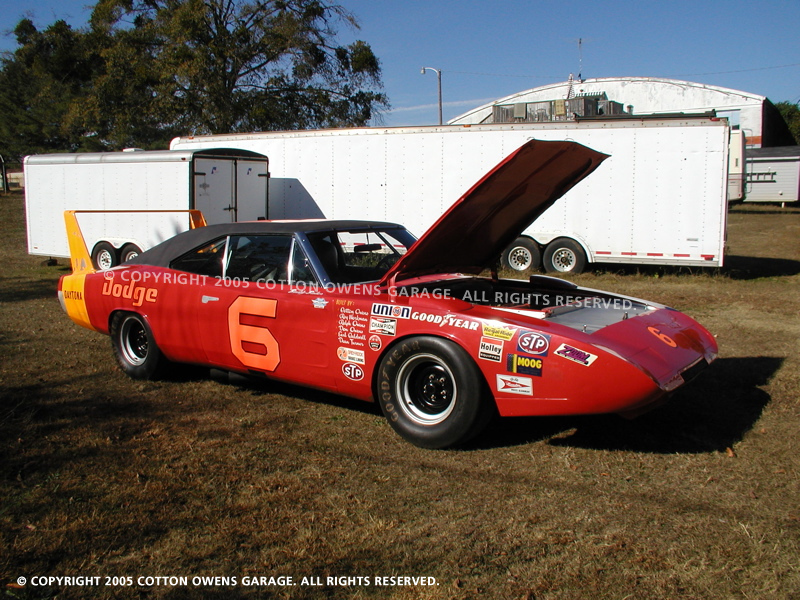 So on March 24, 1970, Chrysler put their factory driver, Buddy Baker, picked from their factory-backed Cotton Owens Garage race team, behind the wheel of the specially-prepared Chrysler Engineering #88 test mule, and set out to officially claim the record at Talladega Super Speedway. Click here to read the actual press release and see photos and video from that day. 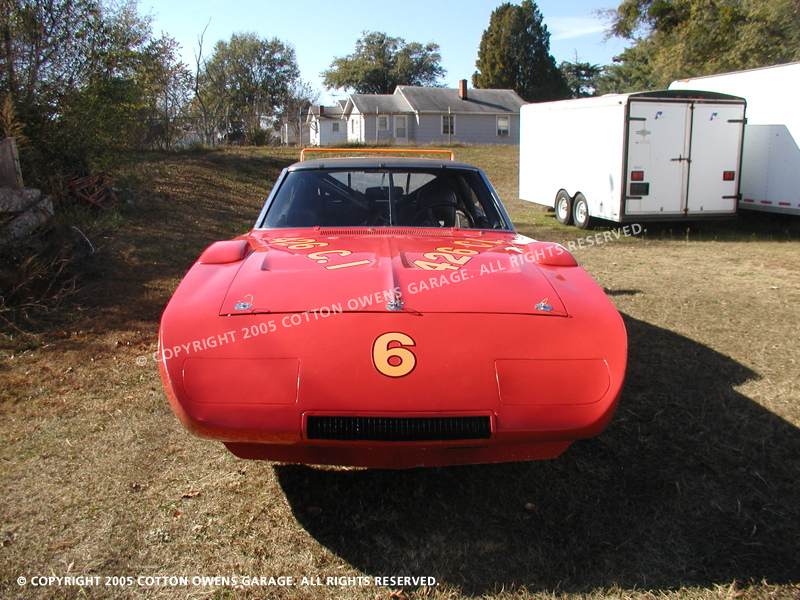 Where things got confusing is that Chrysler and NASCAR did not want to promote the #88 test mule car as having set the record, because it was not a real race car and therefore had little to no PR value to the racing fans and community at large. 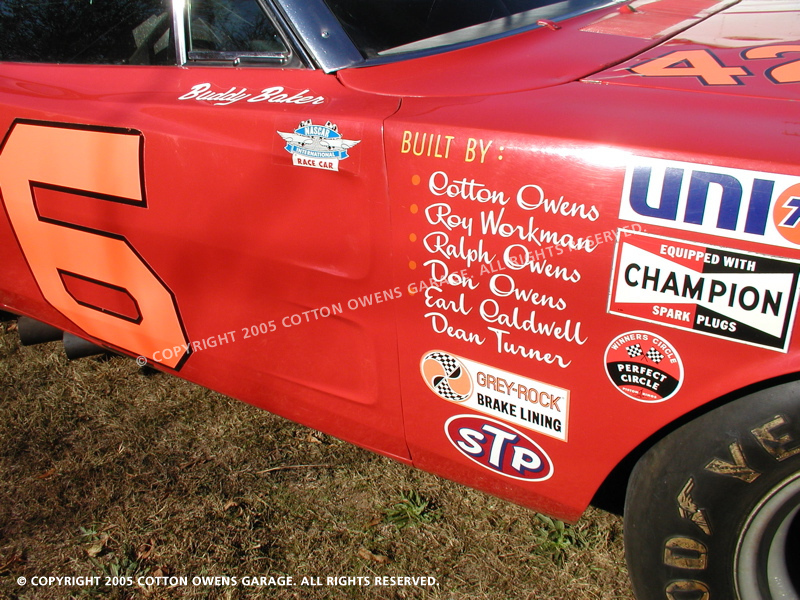 So Chrysler, NASCAR and the media promoted their factory team, the Cotton Owens Garage #6 Daytona, along with their driver, Buddy Baker, along with the 200.447 mph record. Unofficially it (and other winged cars) had exceeded 200 mph before anyway, so that's how it was promoted. There are various publications from this time depicting this, many of which you can find on our website, and several are included below. They simply wanted to maximize the publicity value from their racing efforts with a known driver and team. 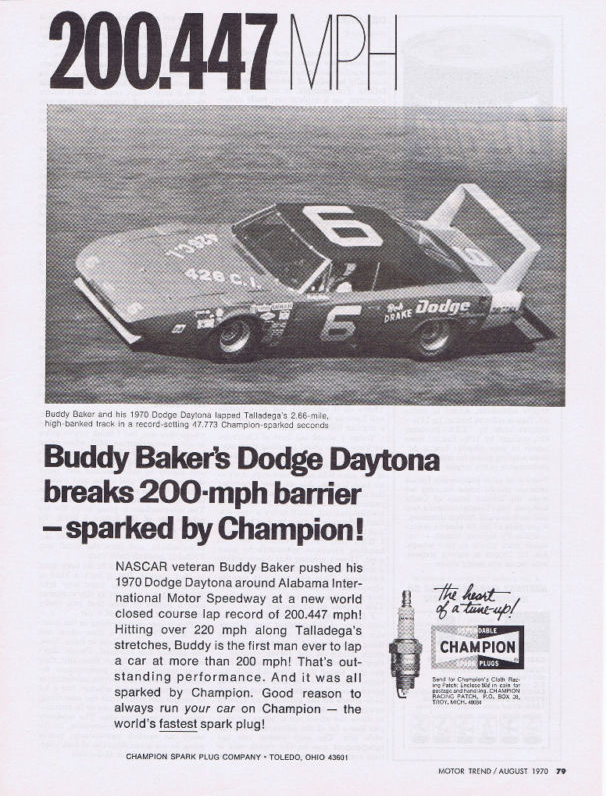 There were other Chrysler teams that had hovered around the 200 mph mark too, but Buddy Baker ("leadfoot") was the most recognized factory driver who had a reputation for flat out driving, and he drove for Cotton Owens Garage, who was also one of the top factory Chrysler teams of the day. Did this #6 car set the "official" 200.447 record? No. Did it ever exceed 200 mph? According to those that were there, yes. 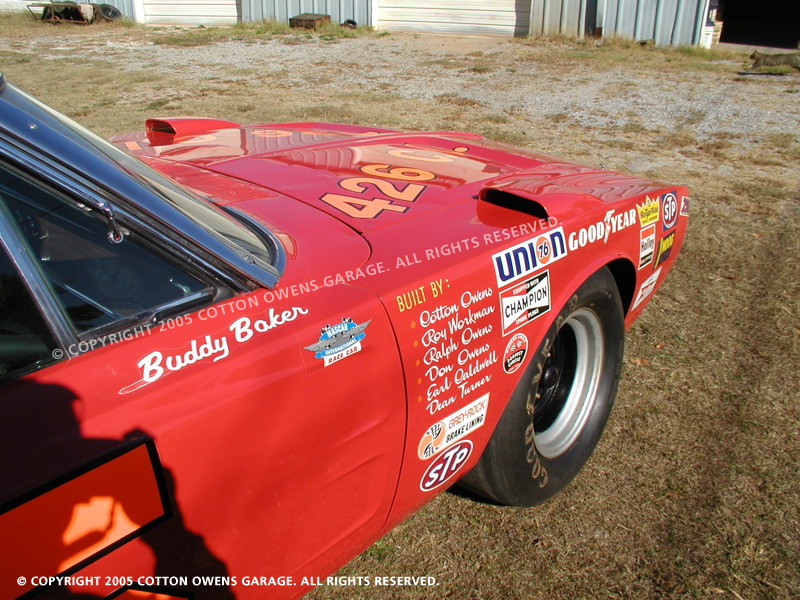 Buddy Baker Pilots Hemi-powered Dodge Charger Daytona to 200 MPH Record! "No, we always thought they went real good. [They were great straight, but I read some of the drivers said they had a heck of a time turning them.] 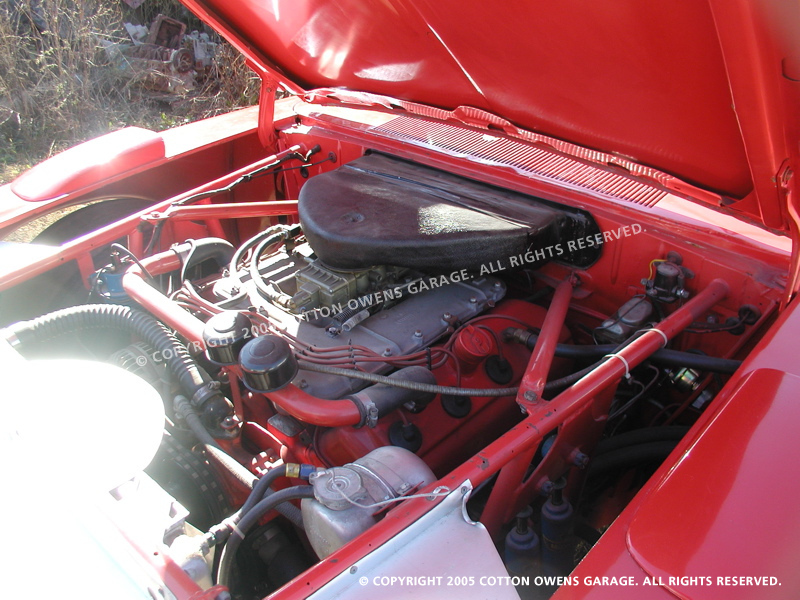 Well, I found out a lot that I guess other people really didn't know--what I said a minute ago--the chassis is just as important as the engine. Chrysler went to Texas and tested. As fast as they run, I bet there wasn't more than two laps at 174 mph. 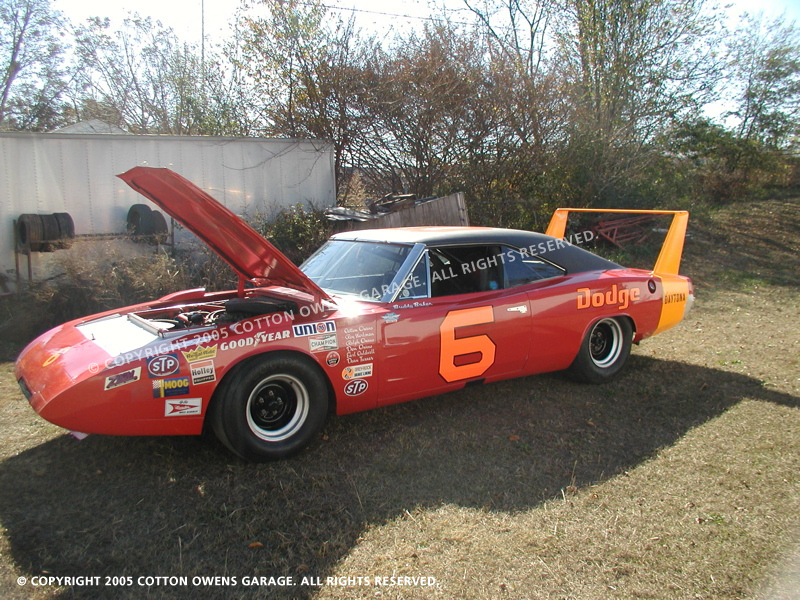 We took that #6 car, unloaded, and ran 176 mph on the second lap around the race track with Buddy Baker. He's the same one, you know, that ran 200 mph at Talladega. It just was the chassis." "I unloaded at Talladega for the first race with the needlenose car and it wasn't none too good at all. I beat some springs on Saturday, and I got my big torsion bars out and Saturday afternoon I ran over 200 mph. I wasn't running but 190 mph before that because it was burying itself in the race track so heavy that it just couldn't pull itself out of it. They got so much down-force on these cars and the ones that are really getting around the race track are running a whole lot stiffer than those other guys." 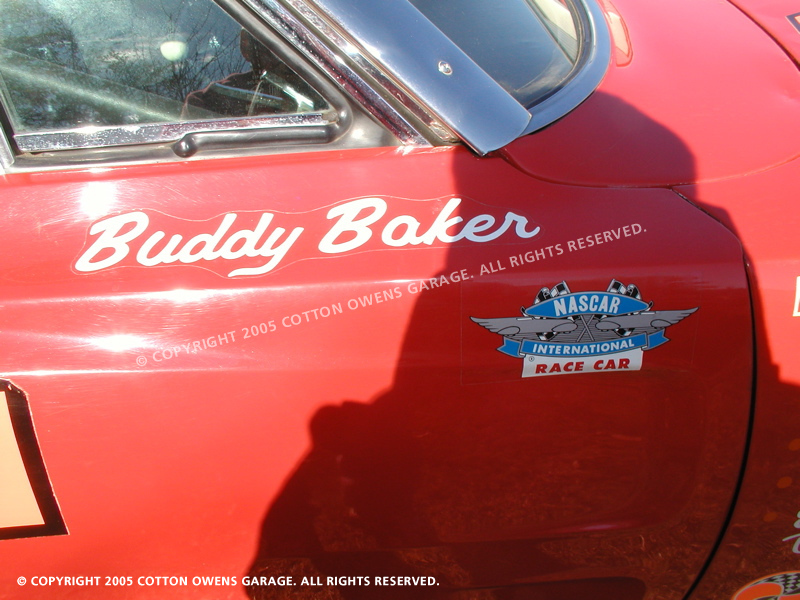 From the book "Flat Out and Half Turned Over - Tales From Pit Road with Buddy Baker" - Chapter 12, "The 200 mph Man": "Dodge picked me to run the first official 200 mph lap at Talladega. We had all run 200 mph before, but not officially. When they did pick me to be the one, there was a lot of bellyaching from the rest of the guys driving Dodges. We got a lot of press. It wasn't a big deal for me back then, but it became a big part of my life." 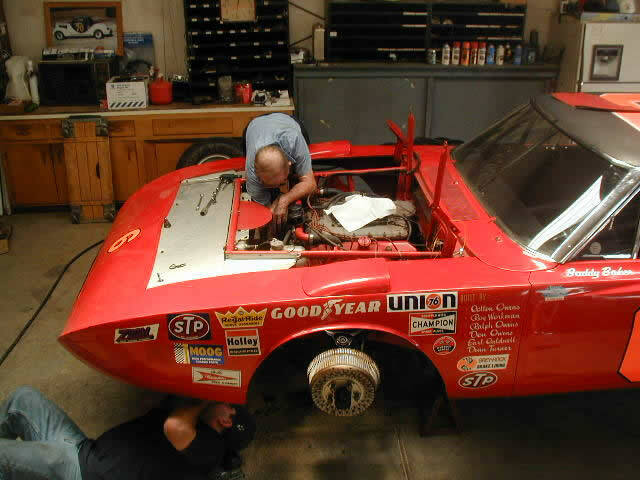 "It'd be hard for race fans today to understand just how well the Charger stuck to the ground with that big wing on it. 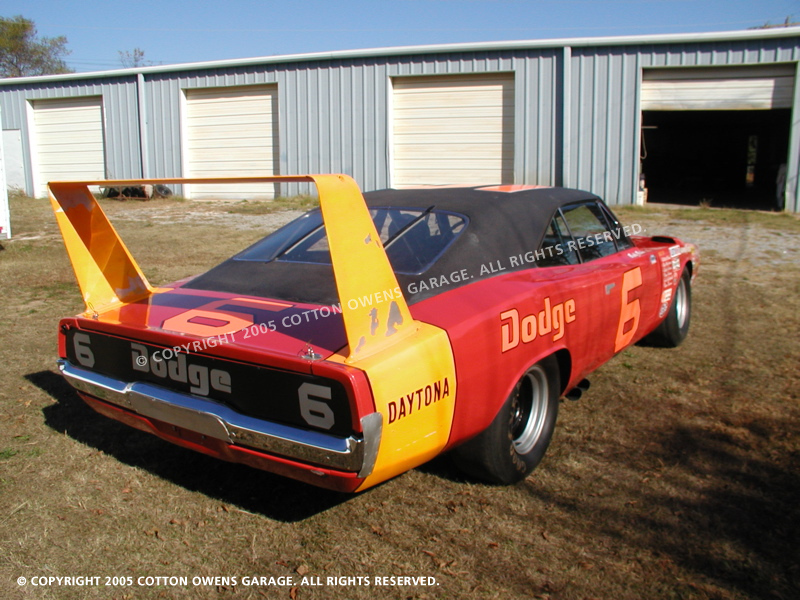 Even without the wing, the old Dodge with the Hemi ran well over 200 mph at Daytona and Talladega. It was a time in the sport when you looked at the car and knew you wanted one of 'em. They were fast. When it cranked up everybody looked. We had great teams back then, too. The car had a certain mystique about it that people still remember. When you say Charger, you think racing. Names stick out for certain manufacturers, and I think it would be hard to improve on Charger for Dodge. What else is there to say? Charge!" The dominance of Ford was more than Chrysler could countenance. Rather than creating limited production aerodynamic bodies (like the fastback Charger) Chrysler turned to its design studios with the objective of creating a production car that was aerodynamic on the track but also stylish and handsome on the showroom floor. The new 1968 Charger hardtop was a beautiful, sleek, design but it wasn't aerodynamic enough. Something more was needed. 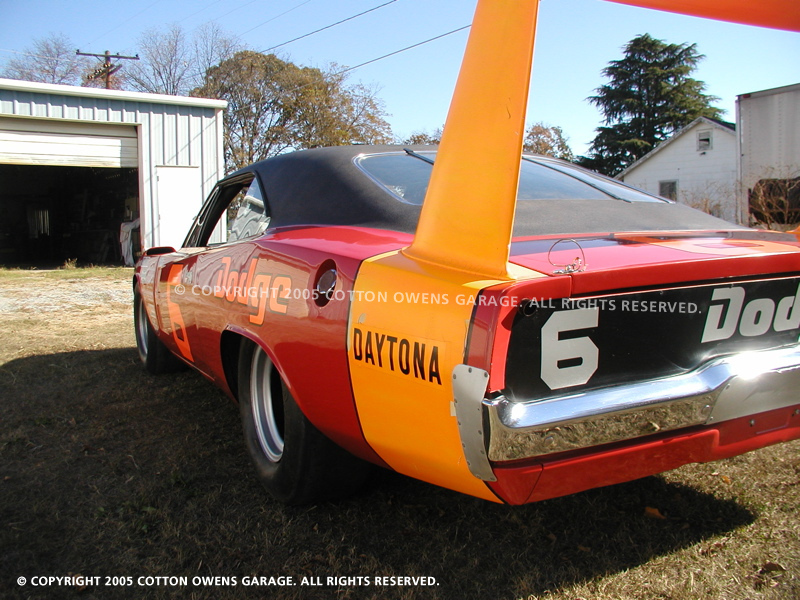 It was the Charger Daytona 500, with flush grille and extended fastback rear glass worth a minimum of five mph. It also prompted Ford to unveil its counterparts, the Torino Talladega and Cyclone Spoiler. They completely dominated the Charger at Daytona in 1969. The Chrysler designers went back to the drawing boards and reviewed their data from wind tunnel testing. 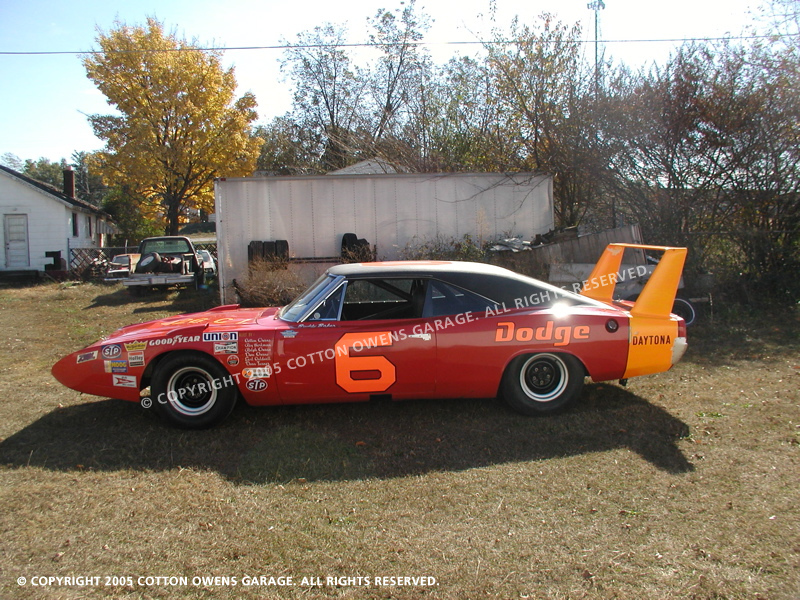 Two teams of Chrysler designers came up with essentially the same conclusion: replace the Charger's ring bumper with an extended aerodynamic nose cone and a low front spoiler.It worked, but it also exacerbated the nose lift problem. Conventional wisdom would counter that with a rear deck spoiler but in practice it would have to be so large most if not all of the advantage created by the nose would be lost. Working simultaneously in the wind tunnel and trying promising changes on the Chelsea test track the solution was found: a wing mounted on tall pylons at the very back of the rear deck. 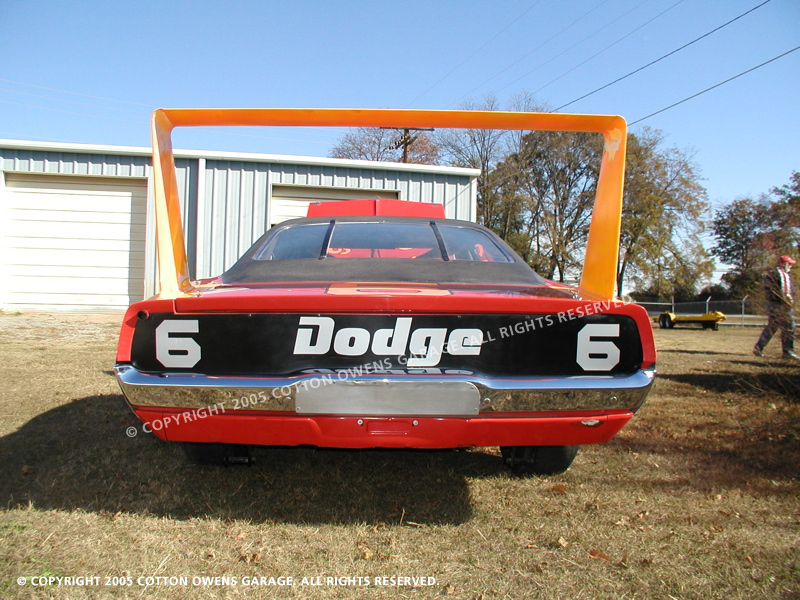 The height of the wing was set not by aerodynamics but by the simple realization that it had to clear the rear deck lid when it was opened. 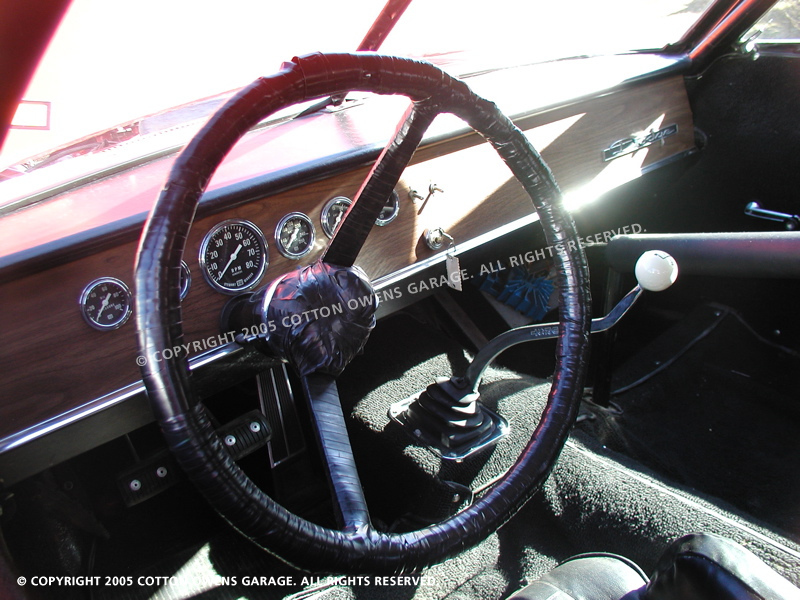 Other design features were added. Running with the nose down helped reduce lift but caused the front wheels to rub the fender tops at speed. They cut out the offending fender areas and added bumps for a little more clearance. Excessive turbulence at the windshield corners was tamed with wind deflectors on the a-pillars. It was outrageous, but it worked. 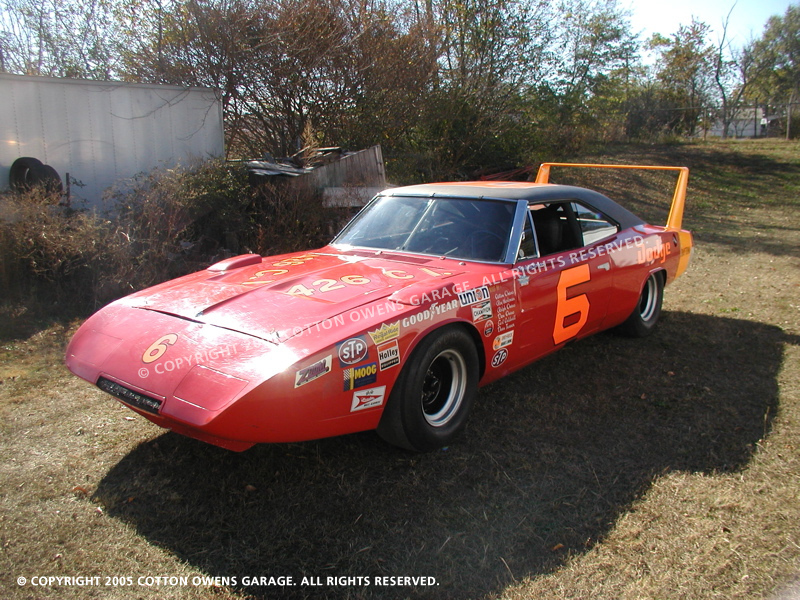 Planned as a 1970 model, a bomb dropped on the engineering staff when the introduction date was pushed up to September, the date of the 500 mile race at the brand new superspeedway at Talladega, Alabama. Track testing at Chelsea continued in parallel with production of the 500 copies needed to meet NASCAR's requirements. On July 27 Charlie Glotzbach lapped the Chelsea oval at 204 mph. 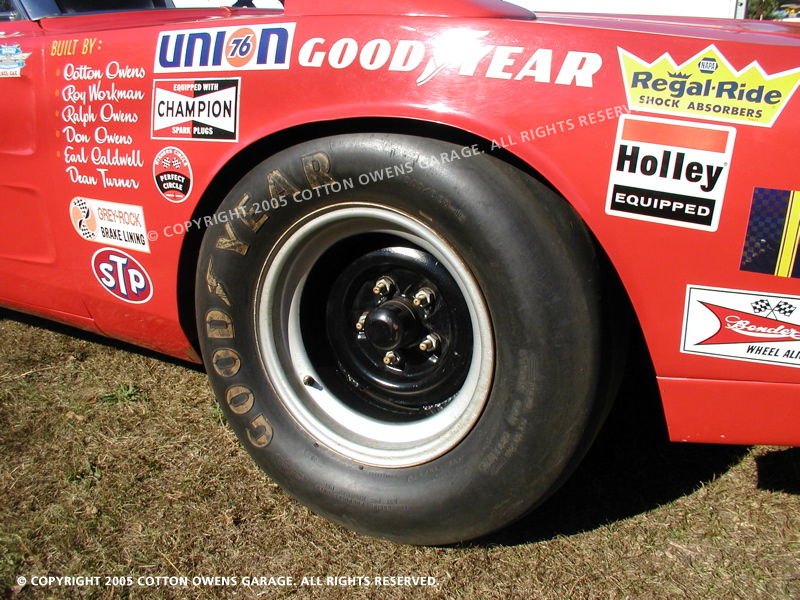 Then testing revealed that the Talladega surface and the record speeds were fatiguing the tires. 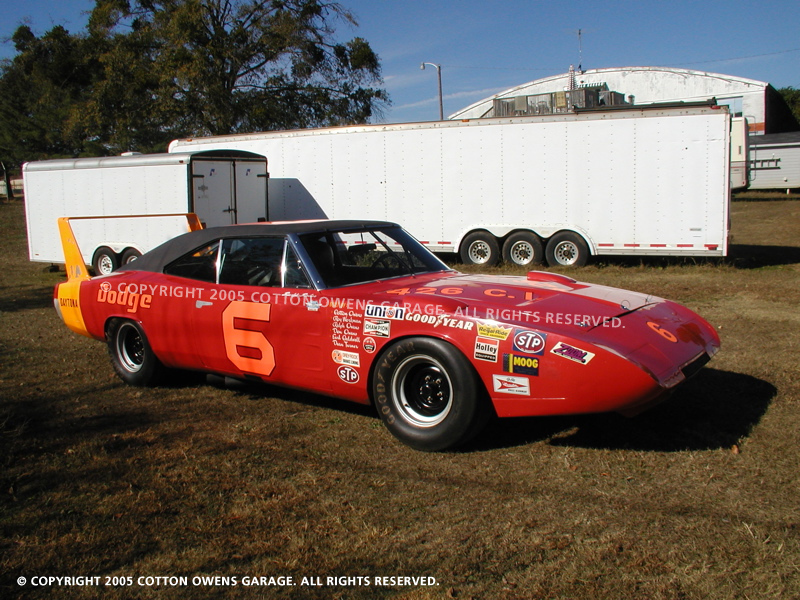 Many top drivers and teams boycotted the race including Chrysler's test driver, Charlie Glotzbach, although a Daytona driven by Richard Brickhouse won at a carefully controlled reduced speed. 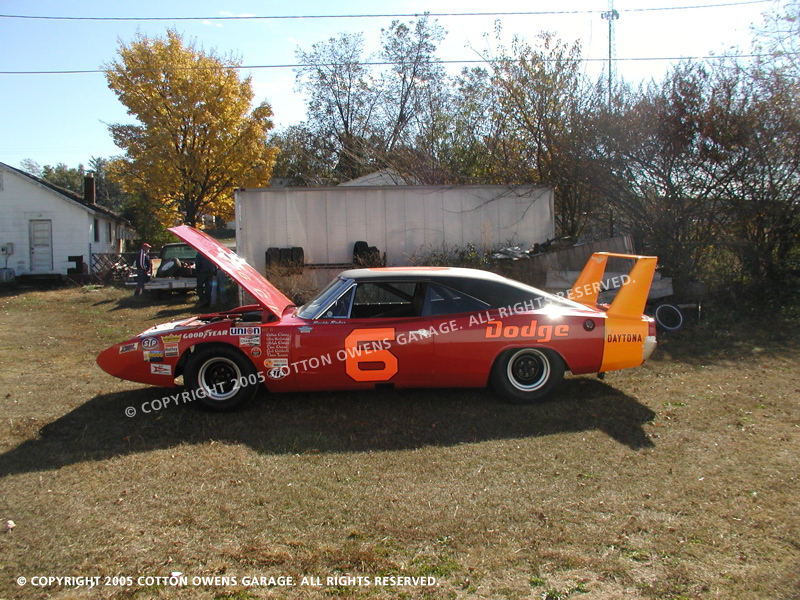 In 1970 the Charger Daytona and its new stablemate from Plymouth, the Road Runner Superbird came into their own and were nearly unbeatable, winning 38 of the season's 48 races. 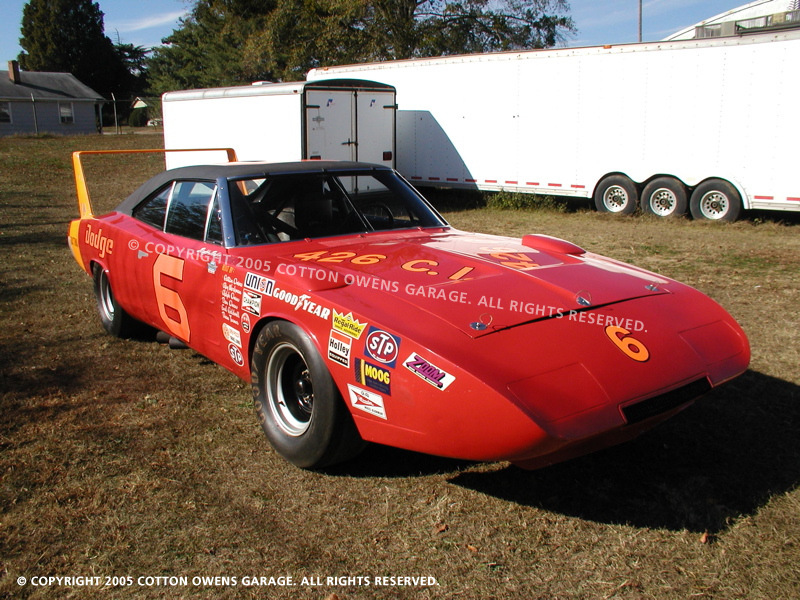 One of the leaders was the Dodge Daytona entered by Cotton Owens and driven by Buddy Baker.